Garage doors are complicated systems, so its natural for you as a homeowner to make some mistakes when handling them. There are many things that can go wrong with these systems, but a lot of them can be easily avoided, as long as you avoid making these three common mistakes. Your garage door is a major part of your house. In fact, it's probably the largest moving part of it. It can be used to park cars, store equipment, or even just as a home office. Regardless of what you use it for, your garage door is a major contributor to the security of your home, and therefore keeping it in good shape is vital. A beautiful garage door also adds value to your home through its curb appeal. It's easy to take it for granted and to forget it needs to be checked and maintained just like any other large mechanical system. If you neglect to do so, you may find yourself suddenly having to deal with more frequent problems, like broken spring or a misaligned track, which can make it impossible for you to use the door, usually when its least convenient. Don't let minor issues get worse. If the door starts to jumps or bounces while it moves, it’s a very likely sign that the track is probably in need of repair or adjustment. This type of problem won't just go away if you ignore it. The second most common mistake that people make is to try and repair their garage door themselves. Let's take a bent track as an example. If you try and just bang on it with a hammer, or tighten up the bolts that fasten it into place, then it could further misalign or damage the track and cause the problem to worsen. 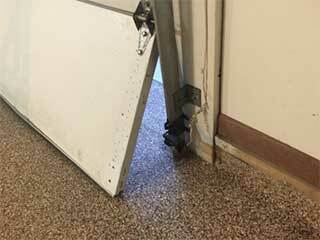 Some parts of your door, like the springs, can be downright dangerous to try and repair, as when they are mishandled they can cause serious injuries, not just become more damaged. Leave the repair work up to the experts. Our technicians are a phone call away if you need them. The most common mistake, as well as the easiest one to correct, is when people neglect their garage door altogether. By regularly examining the system's different components, you could spot a problem before it becomes a major issue. Catching malfunctions early on is extremely important, as it can not only save you a lot of money on more costly repairs but also help you avoid all sorts of potential dangers. Our team at Garage Door Repair Norwalk is here to help you when you need anything fixed or maintained. We work with the best manufacturers and brands in Connecticut, so if you're interested in getting a new opener or a new door, we can help you with that too.